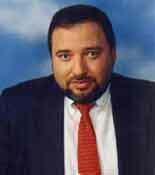 Avigdor Lieberman was born Evet Lvovich Liberman on July 5 1958 in Kishinev, Soviet Union (now Moldova). His father Lev was a writer, who had served in the Red Army and spent seven years in a Siberian exile under Joseph Stalin’s rule. His parents imbued him with a strong secular Jewish identity and consciously taught him only Yiddish up to the age of three. Inheriting a love of Russian literature from his father, Lieberman had dreamed of becoming a poet. After high school, Lieberman enrolled at the Chișinău Agriculture Institute with a hydrological land improvement major. Lieberman and his family immigrated to Israel in 1978 and he changed his first name to “Avigdor.” He served one year in the IDF based in Hebron. Following his discharge from active duty, he continued doing reserve service, during which he underwent an artillery course and served in the Artillery Corps. After his active service, he enrolled in the Hebrew University of Jerusalem. and earned a BA in International Relations and Political Science. While studying at the university, Lieberman worked as a bouncer at a club, which is where he met his future wife. A year later, Lieberman was promoted to general manager, responsible for all the activities at the club. In 1983, Lieberman was one of the founders of the Zionist Forum for Soviet Jewry. He also served on the Board of the Jerusalem Economic Corporation, was the Secretary of the Jerusalem branch of the Histadrut Ovdim Le’umit (National Workers Union) and edited the Yoman Yisraeli newspaper. Lieberman served as Director-General of the Likud Movement from 1993-1996, and then as Director-General of the Prime Minister’s Office (1996-1997). In 1997, Lieberman resigned from Likud after Netanyahu granted concessions to the Palestinians in the Wye River Memorandum. In 1999, he founded and became head of the Yisrael Beiteinu Party to create a platform for Soviet immigrants who supported a hard line in negotiations with the Palestinians. The party ran for the Knesset in the 1999 elections on a joint list with the Aliyah Party, established by former members of Yisrael BaAliyah. The new party won four seats, one of which was taken by Lieberman. He served on the Foreign Affairs and Defense Committee and State Control Committee, and chaired the Israel-Moldova Parliamentary Friendship League. In March 2001, Lieberman was appointed Minister of National Infrastructures. He resigned his post in March 2002. In the 2003 elections, Yisrael Beiteinu ran on a joint list with the National Union. The joint list won seven seats, with Yisrael Beiteinu being allotted four of them. Lieberman was appointed Minister of Transport. In May 2004, Lieberman was dismissed from the cabinet by Prime Minister Ariel Sharon due to his opposition to the Gaza disengagement, and Yisrael Beiteinu left the government in June to protest the disengagement. In the 2006 election, Lieberman’s party split from the National Union to run alone. The party won eleven seats. The party was initially in the opposition, but Lieberman and Prime Minister Ehud Olmert signed a coalition agreement under which Lieberman became the Deputy Prime Minister and Minister of Strategic Affairs, a newly created position focused on the strategic threat from Iran. Following the party’s withdrawal from government, news sources reported that Lieberman was under investigation for allegedly receiving a bribe from Jericho‘s Oasis Casino financier, Austrian-Jewish businessman Martin Schlaff. Nevertheless, Yisrael Beitenu emerged as the third largest party after the 2009 elections and Lieberman was appointed Deputy Prime Minister and Minister of Foreign Affairs in Prime Minister Benjamin Netanyahu’s coalition government. In December 2012, Lieberman announced that he would resign from his Foreign Minister and Vice Prime Minister positions due to the pending indictment against him for fraud and breach of public trust. After being exonerated, Lieberman and Netanyahu signed a merger agreement for Likud and Yisrael Beiteinu to run together on a single ballot in the 2013 elections. Following their victory, Lieberman was appointed Defense Minister, a controversial decision given his relative lack of military experience. In November 2018, Lieberman resigned his post over disagreements with Netanyahu regarding how to respond to terror attacks from Gaza. He was also seen as positioning himself for a possible run for prime minister. He is married to Ella and they have three children. They live in the Israeli settlement of Nokdim.